posted by Billie Owens in Darien, news, hunting accident. An adult male suffered a gunshot wound to the leg while hunting in Darien. "Sounds like bird shot (type of ammunition)," says a dispatcher. He is said to be in a field, conscious and alert, and making his way toward a house. It's on Broadway Road, between Darien-Alexander Townline Road and Smithley Road. Mercy Flight is on a ground standby. Darien Fire Department is responding along with its ambulance. Alexander's gator was called to respond, then cancelled. "Scattered shotgun pattern, right and left lower leg, probably a dozen pellets, minor bleeding at this point," says a first responder. posted by Howard B. Owens in Darien, news. The mandatory referendum on the establishment of Water District No. 6 in the Town of Darien has been completed. The result of the April 10, 2019 referendum is 684 “No” votes, 183 “Yes” votes and one Affidavit vote still pending validation. While the vote count remains unofficial, the result of the referendum will not change. Therefore, the Establishment of Water District No. 6 in the Town of Darien is not approved, and the Town is proceeding to file the required documents to close out this action. posted by Howard B. Owens in maple weekend, maple, Randall Maple, Darien, agriculture. Maple weekend concludes today (March 31). The annual event is a chance for area residents to visit a local maple farm, learn about maple production and the tools and techniques for producing maple and sample some of the items made locally with maple. Saturday we visited with Eric Randall, owner of Randall Maple, founder of Maple Weekend, which is now a national event, and past president of the North American Maple Syrup Council. posted by Billie Owens in news, notify, Darien, fire. Darien beekeeper and mead maker Michael Potoczak is managing to keep his chin up along with his spirits after a swift-moving fire early Sunday morning destroyed his businesses at 541 Bell Road. 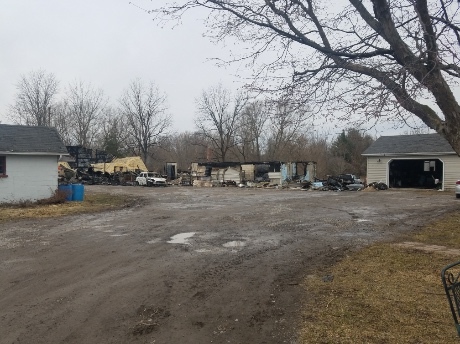 Around 6 a.m. on March 24, callers half a mile away on Sumner Road called 9-1-1 to report the blaze. The Darien Volunteer Fire Department arrived on scene quickly, but the buildings which contained the beekeeping and winemaking equipment were already "on the ground." A Sheriff's deputy pounded on the door of the nearby house to alert the residents, prompting the family's two dogs to bark, waking up Potoczak and his two sons -- who all got out safely, including the dogs. A beloved 14-year-old calico cat named Lily perished in the fire. "I tried to save my diesel truck," said the 77-year-old, who is an associate professor emeritus of Math and Physics at the University of Buffalo. "But it was so hot I couldn't even get near it to open the door." "I've really stood strong. I just deal with it. But it does get emotional," Potoczak said, noting that he lost all the equipment that he had accumulated during 45 years of beekeeping and making wine from honey on his 150-acre property. He's not sure what the future holds for the businesses -- Potoczak Bee Farms and Midgard Winery -- but he will have a better idea of whether starting completely over is possible once the insurance claims are settled in the coming weeks. Turns out the metal buildings, 40' by 60', were insured but nothing inside them was covered. "They really did a number on me," he said. "The insurance agent came out and I took him through and showed him everything. He said I'd have the same coverage; it's not even close. He put in zero where it said the value of the contents and I didn't notice that. You have to have someone who knows insurance read the document to know what it says." By Potoczak's estimation, his loss is worth $400,000 or more. 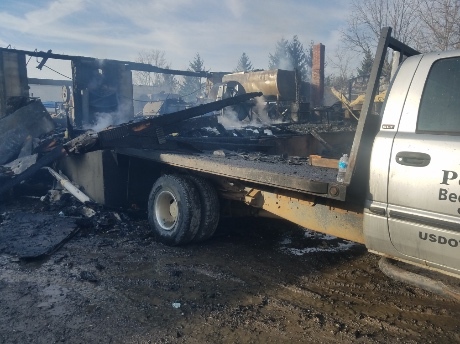 He figures the buildings' value at $250,000 (insurance says $130,000), plus he lost the heating furnace, a new skidster worth $33,000 and the $20,000 diesel truck; $75,000 in winemaking equipment including four stainless steel fermenting tanks worth $4,000 each, filters, and $85,000 in beekeeping equipment. How much he can recoup will influence his decision whether to continue the businesses, which are intended as a way for his children to make a living. His customers, he says, "have been phenomenal" and are encouraging him to start anew. His beehives are all outside and located at different 20 sites for his WNY customers. The mead, which he has sold for about five years, can be found in 50 WNY liquor stores, including locations in Genesee County (Mr. Wine & Liquor), Wyoming County (Warsaw, Attica), Orleans County (Medina), and Erie and Chautauqua counties. The fermented honey wine is about 12 percent alcohol by volume, on a par with, say, cabernet sauvignon. Regardless of what the future holds, Potoczak's daughter, Elizabeth Knaus, said she is grateful to everyone who came to her family's rescue. "I would like to send out a big thank you to the emergency personnel who responded so quickly," Knaus wrote in an email. "Also to the our neighbors who could see and hear the fire and called it in. If it wasn't for them, I probably would not have my dad or my brothers today. Thank you!" Photos courtesy of Elizabeth Knaus. For initial report, click here. 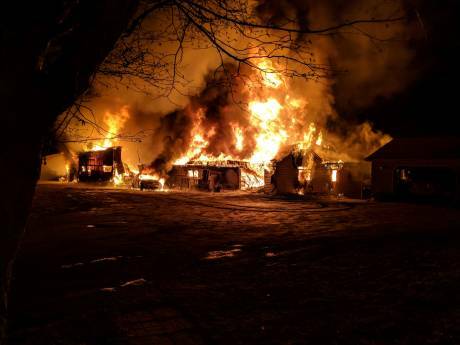 posted by Billie Owens in fire, news, Darien. A working garage fire is reported at 541 Bell Road, Darien. The structure is about 40 to 50 square feet and is "on the ground" -- burned up -- at this point, but there are several exposures to other structures that firefighters will deal with, says a first responder on scene. There's a gap of 20 to 30 feet between the garage and another structure. The city's Fast Team was called, then canceled. All available manpower from Darien is responding, along with mutual aid from Alexander, Pembroke, Corfu and Indian Falls. There's a pond on Bell Road that firefighters may be able to access; it's estimated to be 1,050 feet from the fire. The location is off Fargo Road and it's at the dead end of the street. UPDATE 6:26 a.m.: Alexander is to fill in at Darien's Fire Hall. There's a live power line in front of the garage, firefighters are told. posted by Lisa Ace in Sponsored Post, advertisement, Open Houses, real estate, Darien, Lima, York, batavia. posted by Billie Owens in crime, news, notify, batavia, Darien. Joey Aaron Evans, 28, of State Street, Batavia, is charged with petit larceny. At 4:03 p.m. on March 16, Evans was arrested after he allegedly stole two Dyson V6 vacuums from Walmart. He was arraigned then released on his own recognizance. He is due in Batavia Town Court on April 9. The case was handled by Genesee County Sheriff's Deputy Mathew Clor, assisted by Deputy Michael Lute. Mary Ellen Bruton, 63, of Gilman Road, Churchville, is charged with: driving while intoxicated; DWI with a BAC of .08 percent or higher; and having a vehicle stopped, standing or parked on a highway. She was arrested at 10:32 p.m. on March 17 on Park Road in Batavia following a traffic stop. She was issued an appearance ticket and is due in Batavia Town Court on April 11. The case was handled by Genesee County Sheriff's Deputy Mathew Clor, assisted by Deputy Jeremy McClellan. Justin T. Gladney, 29, of North Spruce Street, Batavia, was arrested on March 13 at 11:37 a.m. on Hutchins Street in Batavia on three separate warrants issued by Batavia City Court. One was a bench warrant for failure to appear. The second was an arrest warrant for failure to appear on an appearance ticket. These were in connection to two petit larceny charges. The third warrant was for first-degree falsifying business records and criminal impersonation in the second degree -- for allegedly giving a false name to the police and while being fingerprinted at the GC Jail. Gladney was put in jail with bail set at $2,500 cash or bond on the first two warrants and bail of $15,000 cash or bond for the new charges that garnered the third warrant. The case was handled by Batavia Police Officer Jason Davis, assisted by Sgt. Daniel Coffey. Pablo Abdiel Cintron Guzman, 18, of Central Avenue, Batavia, is charged with unlawful possession of marijuana. He was arrested at 4:54 p.m. March 17 on Park Road in Batavia following a traffic stop. He is due in Town of Batavia Court on April 4. The case was handled by Genesee County Sheriff's Deputy Mathew Clor, assisted by Deputy Andrew Hale. posted by Howard B. Owens in strongman, sports, Darien, powerlifting. 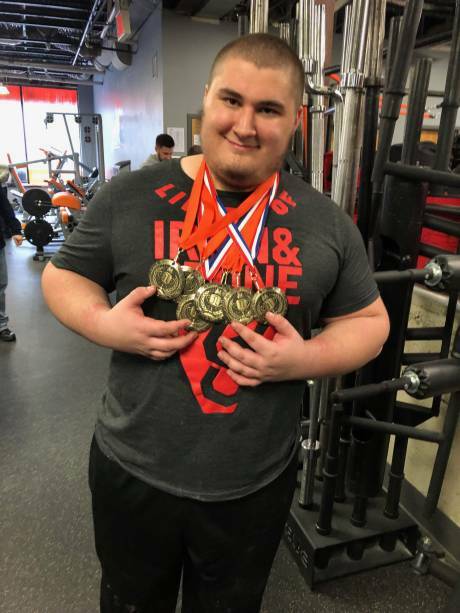 Darien resident Lucas Birkby came home Sunday with five medals from a powerlifting competition in Mamaroneck sponsored by United States Strongman Inc.
Birkby set official state records for the axle clean and press at 320 pounds, the 18-inch deadlift at 700 pounds, deadlift at 650 pounds, the log press at 310 pounds, and the atlas stone, at 360 pounds. The axle clean and the 18-inch deadlift are also national records for the heavyweight teen division. 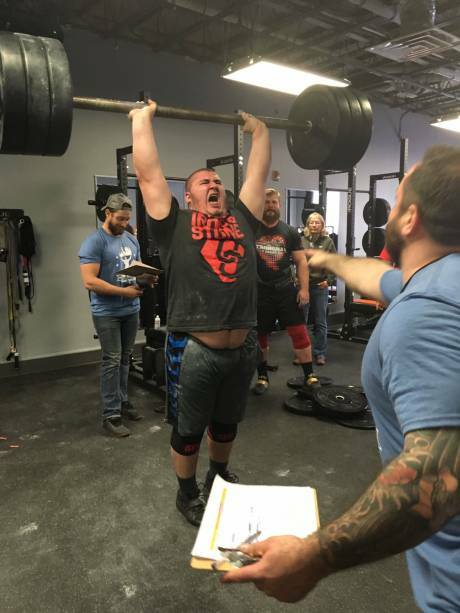 His father, Scott Birkby said, "In addition to training at home, Luke has been training twice a week at Iron and Stone Strength gym in Clarence. His trainer is Tony Kalisz. We found this Strongman gym through a Google search since Luke's ultimate dream is to become the world's strongest man. "I've got the feeling that the fellows there raised an eyebrow when we wrote to them and said that a teenager (he was 17 and just turned 18 this February) wanted to do strongman, but they said: 'go ahead and send him in.' That was about 10 months ago. Luke and the guys (and girls!) at the gym have had a great time since he showed up. Birkby has qualified to compete at the nationals in June in Columbus, Ohio. Scott said his son is PED-free (performance-enhancing drug), adding, "Our grocery bill has taken a pretty big hit for this." Photos and info submitted by Scott Birkby. posted by Howard B. Owens in crime, Darien, news, notify. A grand jury stenographer has allegedly been audio recording grand jury proceedings, which isn't legally permissible, and the attorneys for Jennifer L. Serrano think the stenographer's actions are enough to get a second-degree vehicular manslaughter charge dismissed. The 48-year-old Serrano was charged following the Aug. 11 death of 18-year-old Connor Lynskey after a Jason Aldean concert in Darien. "I was not aware of the recordings until recently and as a matter of an ethical obligation, I notified the defense attorneys involved," said District Attorney Lawrence Friedman. While attorneys Frank LoTempio III, and Jack Sanchez have filed a motion seeking dismissal of the grand jury indictment against Serrano, Friedman doesn't believe the recordings jeopardize the case. "We do not believe, regardless of what the court decides, it will result in the dismissal of the indictment or lead to anything that would delay the case." Friedman has until April 5 to file his answer to the motion with the court and Judge Charles Zambito may conduct a hearing on the motion April 25 at 1:30 p.m. LoTempio and Sanchez have asked to put the stenographer on the stand at the hearing. It will be up to Zambito to decide if there should be a hearing and whether to call the stenographer to the stand. The recordings, if made, are a potential violation of New York's Judiciary Law, though Friedman disagrees with the analysis by LoTempio and Sanchez that the recordings rise to the level of a misdemeanor. Friedman isn't anticipating any charges in the case. Friedman's office had no prior knowledge of the recordings and did not benefit from the recordings. The stenographer is an independent contractor and is not employed by the District Attorney's Office. The stenographer was using a shorthand machine manufactured with the recording capability built right into the device, which is why the DA's office was not aware of the recording being made. Such a mahcine may be permissible in other legal proceedings but in New York, not in a grand jury proceeding. Assistant District Attorney Shirley Gorman discovered the fact that the recordings were being made and brought it to Friedman's attention. Friedman and the ADAs in his office have notified defense attorneys about the recordings but he didn't have a count for how many cases that might involve. As for as his own cases, only one other defense attorney has filed a motion related to the recordings. "The bottom line, I really believe, is this is not going to be an issue that is going to impact cases," Friedman said. "We’re not concerned that we’re going to have indictments dismissed or any that severe as a result of this." As for Serrano, if the case does go to trial, LoTempio said the defense is ready to proceed. They plan to bring forward an expert witness who will testify that Lynskey was intoxicated and either walking or running in the lane of traffic when he was struck. The defense will argue that Lynskey was at fault in the accident, LoTempio said. They also believe there is evidence to indicate that Serrano didn't know she had struck a person and therefore didn't have the requisite knowledge to be charged with leaving the scene of a personal injury accident. The accident occurred Aug. 11 on Sumner Road. Lynskey was with friends and family at the Aldean concert at the Darien Lake Performing Arts Center. They were camping at Darien Lakes State Park. After the concert, the group started on foot back to the campground. The Sheriff's Office report of the accident indicated Lynskey decided to run ahead and catch up with a friend. When both groups were back at the camp, they realized Lynskey was missing. Law enforcement searched the area that night but did not find Lynskey. His body was found the next day in a ditch by the side of the road. Serrano had been stopped and charged that night with a DWI. The accident may have occurred about a half hour before she was arrested. Through leads, Sheriff's investigators identified her as a suspect in the fatal accident. posted by Billie Owens in crime, batavia, news, notify, Darien, Oakfield. Shane Zimblis, 48, of South Swan Street, Batavia, turned himself into the Batavia Police Department on March 9 on a warrant out of Batavia City Court. He is accused of damaging property belonging to another person and causing injury to another person by use of a baseball bat at 12:15 p.m. Feb. 19 on South Swan Street, Batavia. He is in GC Jail charged with: second-degree harassment; fourth-degree criminal mischief; second-degree assault -- injury with a weapon; and criminal possession of a weapon with intent to use. The case was handled by Batavia Police OfficerJason Ivison. A 17-year-old male who lives on Ellicott Avenue in Batavia is charged with endangering the welfare of a child. He was arrested on March 9 for allegedly hitting an 11-year-old male with a piece of wood, causing physical injury. The incident occurred on Maltby Road in Oakfield at 3:20 p.m. on Feb. 28. He is due in Oakfield Town Court at 6 o'clock this evening (March 11). The case was investigated by Genesee County Sheriff's Deputy Mathew Clor. Monica Jane White, 20, of Sunset Park, Oakfield, is charged with issuing a bad check. On March 8, following the investigation of a bad check, White was arrested, issued an appearance ticket, and is due in Town of Oakfield Court at 6 p.m. on March 25. The case was investigated by Genesee County Sheriff's Deputy Joshua Brabon, assisted by Sgt. John Baiocco. Douglas Antwon Spencer IV, 37, of Park Road, Batavia, is charged with: driving while intoxicated with a BAC of .08 percent or more; DWI; open container; and unlicensed operation. Spencer was arrested on Park Road after being found sitting in his vehicle in the middle of the GC Sheriff's Office parking lot entrance with an open container, allegedly driving while intoxicated. The case was handled by Genesee County Sheriff's Deputy James Stack, assisted by Sgt. John Baiocco. Woodrow C. Horseman, 42, of Porter Avenue, Batavia, is charged with petit larceny. On March 8, Batavia police responded to Tops Market in Batavia for a reported larceny. Responding patrols located the suspect on West Main Street and Woodrow Road. He allegedly stole three alcoholic drinks. Horseman was issued an appearance ticket and is due in Batavia City Court on March 12. The case was handled by Batavia Police Officer Arick Perkins, assisted by Officer Nicole McGinnis. Benjamin Jacob Skubis, 24, of Colby Road, Darien, is charged with third-degree bail jumping. Skubis voluntarily turned himself into Alabama Town Court on March 7. He was due there for an unspecified incident on June 7. He was released on his own recognizance and is to reappear in Alabama Town Court at a later date. The case was handled by Genesee County Sheriff's Deputy Thomas Sanfratello. Joseph W. Freeman, 34, no address noted, is charged with failure to appear. He was arrested Feb. 27 on a bench warrant issued Jan. 31 for an unspecified incident. Freeman was released on his own recognizance was due to return to Batavia City Court on March 5. The case was handled by Batavia Police Officer Stephen Cronmiller, assisted by Officer Frank Klimjack. posted by Billie Owens in Darien, Action Trackchair, charity, fundraiser, news. The mother of Ashley McCormack, the 18-year-old wheelchair-bound Darien resident whose dream is to have an Action Trackchair to increase her mobility, says they now have 15 raffle tickets for $15 (for the bunch) on sale. Drawings will be held at the Sunday March 31 fundraiser for Ashley at Darien Fire Hall. All prizes in the raffle each have a value of more than $100, Susan Pfalzer said. "We also have (presale) admission tickets for sale, too, $10 gets you in for food, entertainment and Chinese auction," Pfalzer said. Admission tickets at the door are $15. Time is 1 to 6 p.m. The fire hall is located at 10537 Alleghany Road, Darien Center. The Action Trackchair -- an all-terrain wheelchair -- is highly customizable. Insurance won't cover the cost of it and it retails for more than $11,000. Organizers, friends and family are seeking cash donations, checks, gift certificates, gift baskets and auction items. Cash donations and checks can be made out to: Ashley's Action Trackchair. Send them to: Susan Pfalzer, 1792 Sumner Road, Darien, NY 14040. For corporations and organizations, there is an EIN number available for your donations. For presale tickets, donations or other information about this benefit, call: Cheryl Medina at (716) 863-0388; or (Nana) Annette Pfalzer at 547-9342; or (Mom) Sue Pfalzer at (585) 300-9508. There is also a GoFundMe account set up. Visit here. For previous coverage, click here. posted by Billie Owens in Darien, charity, news, Action Trackchair, ataxia telangiectasia, notify. In photo above, Ashley McCormack embarks on "bossing" an Action Trackchair. Ashley McCormack is a spirited 18-year-old who lives in Darien and has been confined to a wheelchair since she was 10. When she was little she used to go fishing with her dad on Hamlin Beach along the shores of Lake Ontario. They would also hike trails in Letchworth State Park and go camping. Life as she knew it and her outdoor adventures were cruelly curtailed by the onslaught of ataxia-telangiectasia syndrome or Louis-Bar syndrome. She was diagnosed with it at age 8 and by 10 she unable to walk on her own. The progressive neurological disease also makes it hard for her to talk and do a lot of other things. Doctors told her she wouldn't live long, but she's still here, still "wanting to live her life" and enjoy it, too. 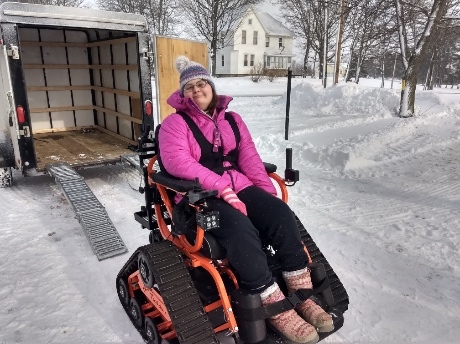 Winters are especially difficult because when ice or mud or snow gets on the wheels of her regular motorized wheelchair, it's easy for her to get stuck. So her mother, Susan Pfalzer, says Ashley's routine is very limited: going from the house to the car -- then to the store or church or the doctor or wherever -- and back again. House-to-car-to-building and back again. Her little pal, a mixed terrier named "Shyla" often accompanies the self-professed animal lover, who volunteers at two local shelters. Enter Cheryl Medina, a longtime friend of the family who found out about an amazing -- and expensive -- piece of equipment: the Action Trackchair. To learn more about it, click here. "Cheryl sent me information about it and it seemed really neat but I didn't think too much about it," Pfalzer said. "But Cheryl is a go-getter and she arranged to have Ashley get a demo of the chair for a day." The all-terrain wheelchair is highly customizable. Insurance won't cover the cost of it and it retails for more than $11,000. The one that Ashley got to try out goes for $16,300. The joy Ashley experienced at being able to get around was unreal. She could go visit her Nana down the road, get some fresh air, pay her respects at the family's pet cemetery in the back yard, tool around. Timid of using it at first, by the day's end she was tackling mounds of snow and showing that Trackchair who was boss. "Ashley is such a good, sweet girl and she's like any 18-year-old -- she wants to be out and doing things," Medina said. "She's so funny and full of life." To help her with this noble mobile dream, Medina and Ashley's mother and her Nana, Annette Pfalzer, will hold a benefit at Darien Fire Hall from 1 to 6 p.m. on Sunday, March 31. It is located at 10537 Alleghany Road, Darien Center. There will be plenty of food and music. Tickets are $10 presale or $15 at the door. Photos courtesy of Sue Pfalzer. 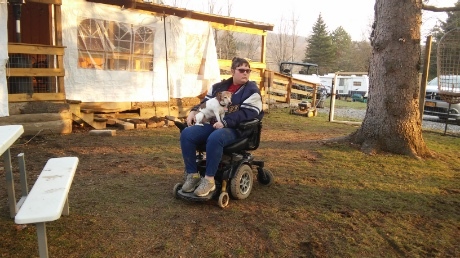 Ashley and her doggie "Shyla" with her regular motorized wheelchair. posted by Billie Owens in Grand Jury, crime, notify, Le Roy, news, Darien, Stafford, batavia. Darnel J. Tillmon is indicted for the crime of assault on a police officer, a Class C violent felony. It is alleged that on Aug. 2 in the Town of Le Roy that Tillmon acted with intent to prevent a police officer -- a New York State trooper -- from performing a lawful duty and his actions caused serious physical injury to the officer. In count two, Tillmon is accused of second-degree assault, a Class D violent felony, by acting intentionally to prevent the officer from performing a lawful duty and his actions caused physical injury to the officer. In count three, Tillmon is again accused of second-degree assault for allegedly recklessly causing serious physical injury to the trooper by means of a deadly weapon or instrument, in this case a motorcycle. In count four, the defendant is accused of third-degree assault, a Class A misdemeanor, for allegedly recklessly causing physical injury to another person -- the trooper. In count five, the defendant is again accused of third-degree assault for acting with criminal negligence, causing physical injury to the trooper by means of a deadly weapon or dangerous instrument -- the motorcycle. In count six, Tillmon is accused of reckless endangerment in the second degree, a Class A misdemeanor, for allegedly recklessly engaging in conduct which created a substantial risk of serious physical injury to another person. In count seven, Tillmon is accused of the crime of unlawfully fleeing a police officer in a motor vehicle in the third degree, a Class A misdemeanor. It is alleged in count seven that Tillmon knew he had been directed to stop his motor vehicle by a uniformed police officer or a marked police vehicle by the activation of either lights or lights and sirens, and he attempted to flee by engaging in reckless driving. In count eight, Tillmon is accused of resisting arrest, a Class A misdemeanor, for allegedly intentionally preventing or attempting to prevent an officer from arresting himself or another person. In count nine, Tillmon is accused of the crime of third-degree escape, a Class A misdemeanor, for escaping from custody. In count 10, Tillmon is accused of failing to comply with the lawful order of a police officer or flagperson. It is alleged in count 10 that the defendant drove a 2006 Kawasaki and failed or refused to comply with the lawful order or direction of a police officer or flagperson duly empowered to regulate traffic. In count 11, Tillmon is accused of the offense of improper passing for operating the Kawasaki and overtaking or passing another vehicle on the right shoulder of the NYS Thruway. In count 12, Tillmon is accused of moving from lane unsafely, a violation of Vehicle and Traffic Law, by riding the Kawasaki on a roadway divided into clearly marked lanes and failing to drive within a single lane and moving from a lane without regard to doing so safely. In count 13, Tillmon is accused of unsafe starting, a violation of Vehicle and Traffic Law, by moving the Kawasaki, which had been stopped, standing or parked, without first determining if movement could be made with reasonable safety. In count 14, Tillmon is accused of failing to use signal lamps, contrary to Vehicle and Traffic Law, by riding the Kawasaki and changing lanes or entering an exit ramp of the Thruway without using signals by hand and arm, or signal lamps. In count 15, Tillmon is accused of speeding for operating the Kawasaki that summer day at a speed greater than was reasonable and prudent under the conditions and without regard to the actual and potential hazards at that time. In count 16, Tillmon is accused of speeding for operating the Kawasaki at 135 mph in a 65-mph zone. In count 17, Tillmon is accused of reckless driving, a violation of Vehicle and Traffic Law, for operating the Kawasaki on I-90 in a manner which unreasonably interfered with the free and proper use of a public highway or unreasonably endangered users of a public highway. Erica R. Leach is indicted for the crime of criminal possession of a controlled substance in the fifth degree, a Class D felony. It is alleged that on Aug. 24 in the Town of Darien that Leach knowingly and unlawfully possessed a controlled substance: cocaine with a weight of 500 milligrams or more. Latashia M. Sanchez is indicted for the crime of driving while intoxicated, as a misdemeanor. It is alleged that on Oct. 18 in the Town of Stafford that Sanchez drove a 2011 Chevrolet on Main Road -- Route 5 -- while intoxicated. In count two, she is accused of DWI, per se, as a misdemeanor, for having a BAC or .08 percent or more at the time. In count three, Sanchez is accused of first-degree aggravated unlicensed operation, a Class E felony. It is alleged in count three that Sanchez knew or had reason to know that her driving license was suspended and that she was driving without a license while intoxicated. In count four, she is accused of driving her vehicle in excess of 55 mph. In Special Information filed by the District Attorney, the defendant is accused of having been charged with DWI, per se, in Town of Le Roy Court on July 31. The prosecution of that crime forms the basis for the suspension referred to in count three. As a result of the prosecution, her license was suspended at 2 p.m. on Oct. 18 and was therefore in effect at 5:19 p.m. Oct. 18, when she allegedly violated the laws resulting in the current indictment. Jeffery C. Rogers is indicted for the crime of driving while intoxicated, as a Class E felony. It is alleged that on Aug. 25 he drove a 2011 Chevrolet with Tennessee plates on West Main Street in the City of Batavia while intoxicated. In count two, Rogers is accused of aggravated DWI, per se, as a Class E felony, for allegedly having a BAC of .18 percent or more at the time. In count three, Rogers is accused of exceeding the maximum established speed limit. In Special Information filed by the First Assistant District Attorney of Genesee County, the defendant is accused of having been convicted of driving under the influence, as a misdemeanor, on April 13, 2015, in General Sessions Court, Knox County, Tenn. That conviction was within 10 years previous to the crimes alleged in the current indictment. posted by Genesee Chamber... in genesee county, food, dining, romantic, batavia, Le Roy, Darien, Date Night. Ladies, slip into that fancy dress you’ve been looking for an excuse to wear. Gents, put on a nice button-down and tie. Take a night to enjoy each other and linger over a delectable meal. We have ten dining suggestions to help you make the most of your romantic evening out. Step into the refined and intimate dining room at Alex’s and your romantic dinner awaits. Elegant meets barbecue goodness with starters like Clams Casino and Bacon Wrapped Scallops. The theme continues with dinner entrees like Rosemary Ribeye, Surf and Turf options, Teriyaki Salmon and more. Alex’s Place is known for their award-winning barbecue but you’ll find there is much more than their delicious ‘cue. Vegan, vegetarian and gluten-free options are available. Walk into welcoming aromas of Italian goodness. Share an appetizer and order a bottle of wine to get your romantic evening started. Choose your main course from any number of traditional Italian dishes from pizza to pasta and everything in between. Stay a little longer and linger over a delectable dessert, perfectly paired with a wine or beverage of choice. Vegetarian and gluten-free options are available. Dine in this adorable and cozy former B & O train depot for a date night out. Indulge in conversation and enjoy friendly service to accompany your home-cooked meal. Start off with their Shortline Sampler including Stuffed Mushrooms, Artichokes French, Clams Casino and Bruschetta. For the main course, you can’t go wrong with the Grilled Norwegian Salmon or Twin Filet Mignon. Vegan, vegetarian and gluten-free options are available. Nothing says romance like a table overlooking the scenic Oatka Creek from the warmth of a historic building in downtown Le Roy. Delight yourselves in beautifully created cuisine, carefully chosen wines and hand-crafted tavern cocktails. Farmer’s Tavern Fare and Dinner menus are unlike anything else you’ll find in Genesee County. Each dish is as aesthetically pleasing as it is delicious. Want to extend your romantic night out? Book an overnight in one of their beautiful suites for the perfect end to a perfect evening. Vegan, vegetarian and gluten-free options are available. Beyond the shining lights and exciting noises of the gaming floor is a cozy and quiet restaurant to retreat to and enjoy the evening. The menu hosts an abundance of local and international wines, choices of appetizers to share and upscale pasta, steak and seafood dishes to complete your meal. Cozy up in a booth, enjoy your company and before you go hit the gaming floor to try your luck. Vegetarian and gluten-free options are available. Tried and true but now better than ever, LB Grand Steak and Spaghetti House is ready to welcome you and your sweetie to a wonderful dinner in their newly renovated space! Care is taken when creating every dish at LB and if you haven’t visited in a while, you’re in for a treat. Their menu hosts a variety of beloved Italian classics, any of which will add to the magic of your romantic night. Some unique and tasty dishes to consider (other than their steak and spaghetti) are the Steamed Mussels, Grilled Salmon and Braised Pork Shank. Vegetarian and gluten-free options are available. There’s more to Main Street than pizza. Dine in their upscale Italian dining room, the perfect setting for a night out all dressed up. Classic Italian cuisine paired with playful presentation, and a good glass of red, will delight all of your senses. The meatballs are the size of softballs and their Pasta Puttanesca is an award winning dish. Some additional Main Street favorites include their Arancini, Cape Cod Salad, Main St. Butchers Block and Seafood Fra Daivlo. Vegetarian and gluten-free options are available. Feel a world away at River Spring Lodge for one of the most romantic nights out. From arrival to departure, your experience will feel nothing short of magical. Grab an overnight room and sit down to a five course dinner that will blow you away. Chef Dave and Carolyn welcome you to sit back and relax while they serve you only their best. Enjoy generous portions of beautifully crafted cuisine at each course with no rush because the table is yours for the night. Be impressed and delight in your company; these memories will last a lifetime. Vegan, vegetarian and gluten-free options are available. Famous for their Prime Rib carved tableside, Red Osier is destination dining at its finest. With newly renovated dining rooms and an inviting farmhouse feel, your romantic night out may reach a new level at The Original Red Osier. Indulge in the classic and beloved Prime Rib dressed how you like with toppings à la carte. For an extra special occasion, add some surf to your turf. Besides Prime Rib, Red Osier offers other delectable Steak, Lamb, Chicken, Pork and Seafood options. Try to save room for dessert; a night out at Red Osier isn’t complete without a Bananas Foster Flambé for two. Gluten-free options are available. Sushi is the specialty at Yume Asian Bistro and their presentation is what sets them apart; whatever you order looks like a masterpiece when it arrives at your table. Yume treats each ingredient with utmost respect as to deliver you a delicate sushi plate more beautiful than anything you’ve ever seen before- besides your date sitting across from you, of course. Find truly unique and interesting fish on the menu and be adventurous together - try something new! Enjoy the evening, each other and the food. Vegan, vegetarian and gluten-free options available. Brought to you by the Genesee County Chamber of Commerce & Visitor Center. To view a full list of our restaurants in Genesee County, click here! Bon Appétit! posted by Howard B. Owens in accident, news, Darien. A car vs. pole accident is reported at 9864 Fargo Road, Darien. An ambulance is requested to the scene for evaluation of the driver. The pole is snapped and wires are down. Darien fire and ambulance dispatched. posted by Billie Owens in news, notify, crime, Darien, alexander. Charles Elias Cooper, 35, of West Seneca Street, Lodi, and Joshua Dennis Cooper, 32, of Dunlap Road, Ovid, are charged with: soliciting without a permit; a scheme to defraud in the second degree; and 6th-degree conspiracy. In addition, Joshua Dennis Cooper is also charged with fourth-degree criminal mischief. At about 2:30 p.m. on Monday, Feb. 4, the Genesee County Sheriff's Office received a report of individuals trying to scam residents for driveway repair work on Alleghany Road (Route 77) in Darien. The investigation revealed that the defendants were allegedly performing work at a residence without the property owner's permission and then tried to charge the property owner multiple sums of money. The defendants were arrested and arraigned in Darien Town Court. The investigation was handled by Deputy Kevin McCarthy, Deputy Kevin Forsyth, Deputy Kyle Krzemien, and the NYS Police Commerical Motor Vehicle Unit. Emily Elizabeth Dale, 27, of Water Street, Attica, is charged with: driving while intoxicated; unlicensed operation of a motor vehicle in the third degree; speed not reasonable and prudent; moving from lane unsafely; and unlicensed operator. Dale was arrested following an investigation into a motor vehicle accident on Maplewood Road in the Town of Alexander at 5:38 p.m on Feb. 1. Dale was allegedly operating her motor vehicle in an intoxicated state when she drove off the roadway. Her operating privileges were allegedly suspended at the time. She was taken to Strong Memorial Hospital for a mental health evaluation. She is due in Town of Alexander Court this afternoon (Feb. 5). The case was handled by Genesee County Sheriff's Deputy Michael Lute, assisted by Mathew Clor. A snowmobile rollover accident is reported on Broadway Road, between Harlow and Countyline roads, in Darien. The snowmobile reportedly rolled over on the driver but the driver is believed to be out from under the snowmobile now. Darien fire and ambulance and Mercy EMS dispatched. The location is slightly off the roadway. Somebody is waiting roadside to direct emergency responders to the location. UPDATE 10:56 a.m.: No injuries. Darien fire and ambulance canceled. posted by Howard B. Owens in weather, news, pembroke, Darien. Here's a short video tour of the weather Thursday afternoon in Pembroke and Darien.